Located in the heart of the Sugarhouse business district, these Conference Suites are provided by TO&A for our attorney clients who need convenience and professionalism in a relaxing business environment. 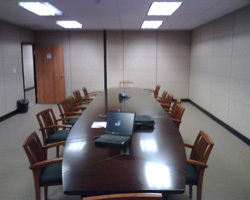 Situated in Sugarhouse Parkview Plaza, our fully furnished conference/deposition rooms offer state-of-the-art LCD projectors, VCRs, high speed internet access and videoconferencing on request enhance the effectiveness of communication and presentations. Our professional and dedicated litigation support staff is available to see that your deposition is a success.